Is the toilet in your Scotts Valley, CA home in need of repair? We’ll come take a look at it and let you know what needs to be done. After all, we are Scotts Valley’s plumbing experts, and no job is too big or too small for us. We’ll listen to you, examine the problem, and let you know what needs to be done to get your toilet up and running so you and your family can get back to your lives. We now that a busted toilet can be a homeowner’s worst nightmare. That’s why we are here for you. Whether your problem is ongoing or emergent, give us a call and let us know when it’s convenient for you to have a plumber in Scotts Valley come out. We’ll show up on time, look at your toilet, and get it repaired quickly and efficiently. Many people feel silly calling a plumber because of a toilet, unless the toilet is overflowing or has a major leak. They feel like they should be able to fix the toilet themselves, or like the problem is too small to warrant a plumber. However, staying on top of your toilet problems is important. Most of the time, we can perform a simple fix in order to prevent a much larger problem later on. Trust us when we say that you don’t want your toilet problem to get out of control! Here are some things that people in Scotts Valley call us for all the time. Overflowing toilets. If your toilet is overflowing and you can’t stop it, or it overflows regularly, it’s time to call a plumber. We’ll help you turn off the water to the toilet, so it can’t do any more damage than has already been done. Then, we’ll figure out what the problem is, and whether there’s anything else going on that is underlying the problem. Once we have a handle on the cause, we’ll get things fixed for you fast. Leaky toilets. Does your toilet leak onto the bathroom floor? This can mean that there’s a problem with the seal around the base. We’ll determine the source of the leak, and then we’ll get it fixed. This can mean removing your whole toilet, which sounds daunting to homeowners. For us, though, it’s all in a day’s work. We’ll get your seal fixed and your toilet working again. Running toilets. Does your toilet run and run unless you jiggle the handle? Maybe you’ve replace several parts inside the tank, but it hasn’t helped at all. We’ll come out and examine your toilet. Once we know why it keeps running, we’ll be able to fix it quick. 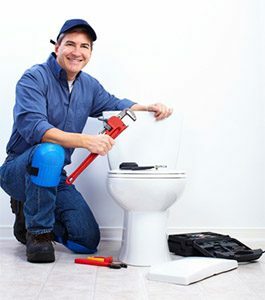 Call Rosenthal for your toilet repairs in Scotts Valley, and you won’t be sorry. We have many satisfied customers in the area, and we’d love to add you to their number. Next time your toilet malfunctions, give us a chance to show you why so many people rely on Rosenthal.